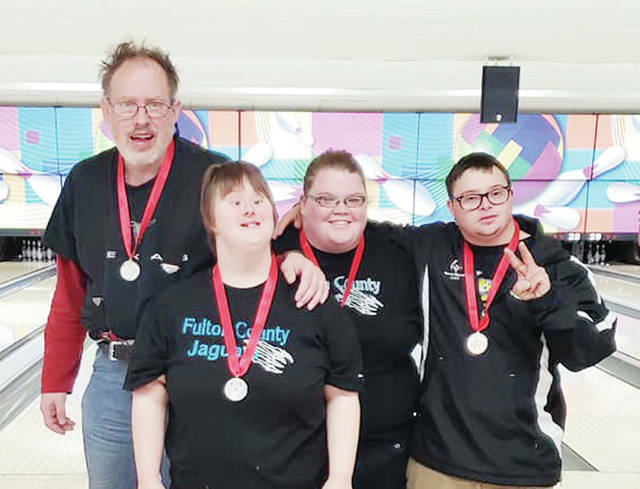 Fulton County Special Olympics traveled to Columbus to compete in the 2018 State Bowling Competition. Results for the Jaguars were as follows: Team 1, consisting of Roger Wolfram, Jason Fields, Jason Pfund, and Ann Schroder, received fifth place. Team 2, consisting of Lennon Tilse, Danni Smith, and Danelle Bodette received a silver medal; and Team 3, pictured, consisting of Austin Double, Phil Bartus, Jenny Whaley, and Brianna Lillie, also received a silver medal. https://www.fcnews.org/wp-content/uploads/sites/45/2018/10/web1_special-olympics.jpgFulton County Special Olympics traveled to Columbus to compete in the 2018 State Bowling Competition. Results for the Jaguars were as follows: Team 1, consisting of Roger Wolfram, Jason Fields, Jason Pfund, and Ann Schroder, received fifth place. Team 2, consisting of Lennon Tilse, Danni Smith, and Danelle Bodette received a silver medal; and Team 3, pictured, consisting of Austin Double, Phil Bartus, Jenny Whaley, and Brianna Lillie, also received a silver medal.